A fully managed NoSQL cloud database service that enables storage of a massive amount of structured and semi-structured data. Table Store is a distributed NoSQL data storage service built on Alibaba Cloud's ApsaraDB distributed computing system, which comes with 99.99% high availability and 99.999999999% data reliability. Table Store enables seamless expansion of data size and access concurrency through data sharding and server load balancer technologies, providing storage of and real-time access to massive structured data. Three copies of data with high consistency, full host, service high availability and data high reliability. Elastic resources, Pay-As-You-Go billing, and O&M with no additional costs. Distributed architecture, single table auto scaling, support of 10-PB-level data and 10-million-level access concurrency. Provides full/incremental data tunnels, seamlessly interconnecting with various products for big data analysis and real-time stream computing. Table Store provides low-cost, low-latency, and high-concurrency storage and online access of massive data, as well as incremental and full data tunnels, with support for SQL direct read and write on MaxCompute and other big data analysis platforms. Effective incremental streaming read interface allows easy real-time stream computing of data. Table Store can be used to store IM messages and social feed stream information such as comments, follow-up posts and likes. The elastic resources stored in Table Store are billed under the Pay-As-You-Go model and at a relatively low cost Table Store can meet the needs of applications that feature significant traffic fluctuations and high concurrency while requiring low latency. The low latency, high concurrency, elastic resources and Pay-As-You-Go billing method of this service enables your risk control system to always operate in optimal conditions, allowing you to strictly control transaction risks. Meanwhile, the flexible data structure allows your business model to rapidly evolve to meet market demands. A single table can store petabytes of data without distributing data in separate databases and tables, which simplifies the service logic. The schema-free data model enables easy access to the monitoring data of different vehicle-mounted devices. Table Store can be seamlessly integrated with multiple big data analysis platforms and real-time computing services for fast real-time online query and service report analysis. 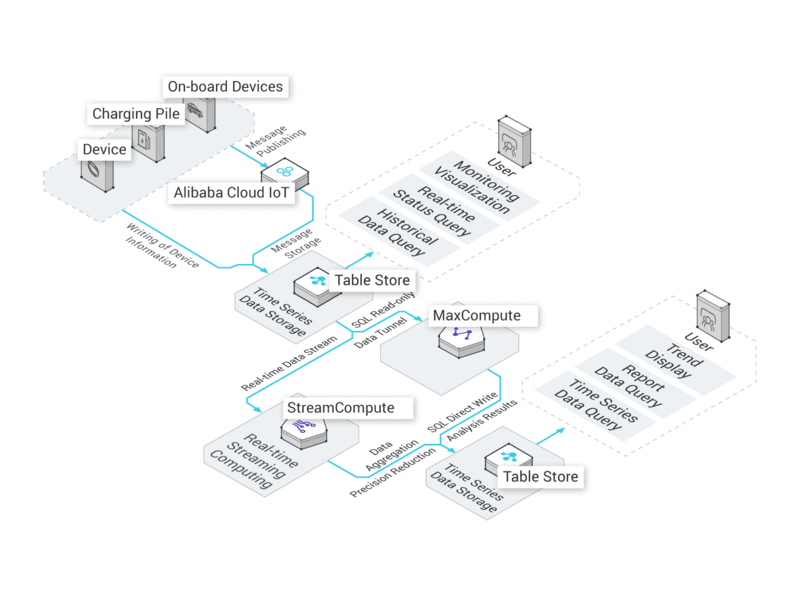 With a single table capable of storing petabytes of data and processing thousands of queries per second (QPS), Table Store makes it easy to store the time series data of IoT devices and monitoring systems. The big data analysis SQL direct read function and the efficient incremental streaming read interface provide an easy way for offline data analysis and real-time stream computing. Using Table Store for a large number of historical transaction orders makes it possible for you to deal with high data volume and access performance with ease. Combined with MaxCompute, Table Store enables precision marketing, elastic resource storage, and Pay-As-You-Go billing, so that you can easily cope with peak hours when all your users are online.